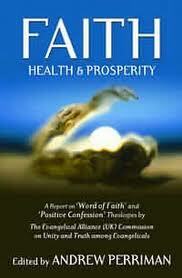 Andrew Perriman, Faith, Health and Prosperity (UK: Paternoster, 2003 / USA: Gabriel Resources, 2004), 214 pages. It is not difficult finding faults with the modern faith movement. For many people, in fact, it seems to have become something of an obsession. One does not need a theology degree to demonstrate how scriptures have been taken out of context, compromised or misconstrued in the effort to secure an absolute basis for the believer’s right to experience pleasant circumstances, prosperity and full bodily health (on this side of heaven!). What is required, I believe, is some Christian charity, a good deal of patience, and a willingness to understand rather than to condemn, if the rift between the faith movement and main-stream evangelicalism is to be healed (cf. 1Th. 5:19-21; 2Tim. 4:2-3). Unfortunately, many of the so-called “pop-apologists” of our time seem to know only one word for classifying errors and excesses in their polemics—the singularly divisive and frequently misapplied appellation of “heresy.”1 In addition to this, they are often caricaturists. Choosing a good piece of apologetic work over a bad one has itself become an exercise in discernment! My own exposure to Word of Faith teaching, however, has left me with a more ambivalent, less clear-cut impression of its spiritual health that will not submit to a ringing endorsement or a blanket condemnation. I am glad I am not alone in that. In a 316 page report entitled Faith, Health and Prosperity, Dr. Andrew Perriman provides a needed balance in the debate over the Word of Faith movement which will appeal to more conciliatory Christians who, though troubled by the faith movement’s mistakes, would want the option of affirming some of the good things that it has to say. Faith teachers force us to look again at some of the traditional assumptions about poverty and piety; confront us with the radical possibilities of faith; and challenge us to expect much more from a generous and abundant Father-God, who made earth as well as heaven, body as well as soul, and is willing to bless us so that we can be a blessing to others. Nevertheless, in their enthusiasm for “the good things in life,” many would say that they have seriously distorted the fabric of Christian teaching, falling head over heels into an obviously “over-realised” eschatology that downplays the scriptural themes of suffering and hardship; promoting an individualistic doctrine of prosperity that disregards important differences in situation and calling; reducing the believers reliance on and relationship with God to the operation of a legalistic system of spiritual laws; and pushing biblical faith to an irrational and presumptuous fideism that radically disconnects our perception of God’s “truth” from “the facts,” encouraging believers to say “what they know ain’t so.”2 And just what are we to do with some of the stranger bits of theology the faith movement has come up with—the “JDS” doctrine,3 or the “little gods” theory, for example, that have so upset evangelicals across the globe? Andrew Perriman endeavours to sort through these issues, calmly disentangling “the rampant Russian ivy of error” from “the delicate wisteria of truth” (217), as well as challenging evangelicals with the possibility of a more balanced appropriation of some of the Word of Faith movement’s emphases. Written on behalf of the UK Evangelical Alliance and bringing substantial biblical scholarship to bear on the debate, Perriman’s report is an authoritative critique that seeks to praise as well as rebuke, encourage as well as criticise, and learn as well as teach, trailblazing “a path towards constructive dialogue and reconciliation” (15). 1 I am not suggesting we should never call anything heresy. But when the word is used so often, and for things we need not disfellowship over, it becomes less meaningful—though it seems to retain its power to divide! A more sophisticated system of classification is required. eg. Bowman, Orthodoxy and Heresy: A Biblical Guide to Doctrinal Discernment. 2 I am referring here to the faith movement’s practice of confessing as a present reality the thing being sought for by faith. 3 JDS stands for “Jesus died spiritually.” The acronym refers to the faith movement’s doctrine that Christ had to die spiritually as well as physically, go to hell and experience a spiritual rebirth in order to secure our redemption. About the Author: W. Simpson, PhD (University of St. Andrews, Scotland), is a physicist and writer with an interest in theology, currently engaged in scientific research in the middle-east.